Pictured above: The Valley Complex Fire (Derby, MT). Photo credit: Karen Wattenmaker. Courtesy of the Northern Rockies Incident Information Center. Pictured above: Convective heat spreads fire from ground fuels up a tree into aerial fuels during the Winter Valley Fire (Craig, CO). Notice how the wind pushes the flame. Photo credit: Kari Brown. Courtesy of the Northern Rockies Incident Information Center. Wildland fires spread in two phases. 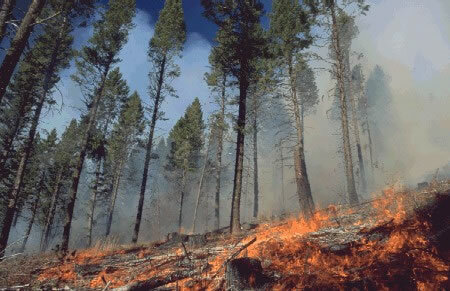 First, convected heat causes the fire to spread from low vegetation such as grasses, underbrush and leaf litter (ground fuels) to higher vegetation (aerial fuels) such as tree branches, often via the mid-sized vegetation. In this phase, the fire grows vertically (see Fig. 2). As the fire increases in intensity and size, involving fuels at all levels, radiant heat becomes the primary method of spread at both the aerial and ground fuel levels, and the fire grows laterally. Pictured above: Ground fire behavior in an open Ponderosa Pine stand. Photo credit: Kari Greer. Courtesy of the Northern Rockies Incident Information Center. Ground fuels "include all flammable materials lying on or immedately above the ground or in the ground" (NFPA 921: Guide for Fire and Explosion Investigations 2001 Edition, section 23.2.2, page 921-183). Examples of ground fuels are duff, peat soils, tree roots, leaf litter, grass, low brush, and dead wood. 921 includes a detailed discussion of the flammability potential of each of these fuels. In general, dead leaves and coniferous litter, especially dry pine needles and fine dead wood (diameter of less than 2 in. ), can play the greatest role in fire spread because they are easily dried out and loosely arranged, allowing free flow of air around them. See Figure 3 for an example of ground fire behavior. Fine, dead wood ignites easily and is often the kindling for larger fuels, like downed logs and large tree limbs. Not all ground fuels necessarily accelerate fire spread. For example, low brush might actually retard fire spread because it can hold moisture in at the ground level, keeping leaf litter wet and therefore less susceptible to ignition. Pictured above: A close-up look at "bridge" fuels involved in the Valley Complex Fire (Derby, MT). Photo credit: Karen Wattenmaker. Courtesy of the Northern Rockies Incident Information Center. The "bridge" between ground fuels and aerial fuels is often mid-sized brush, saplings, partially-downed tree branches, and small trees (see Fig. 4). These materials catch fire due to their proximity to flaming ground fuels, then spread that fire upward to mature trees and outward to other materials. The direction and intensity of wind is influenced by global wind patterns, differences in atmospheric pressure, solar convection1, topography, and the fire itself. Entrainment of air into the rising fire plume actually creates wind that can further feed the fire's spread (see Fig. 5). At its most intense, fire winds can develop into a fire storm, where indrafts into the convection column can create tornado-like effects. Ground level depression geographic features, such as valleys, can laterally confine the fire. Confinement concentrates the heat in a smaller airspace, increasing combustion and fire spread potential. 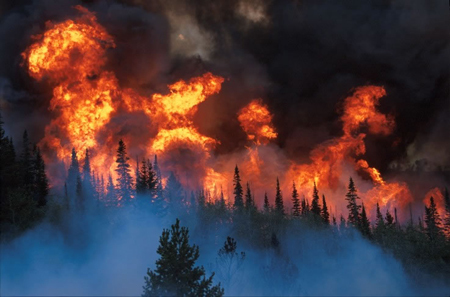 Pictured above: Extreme fire behavior in a dense, mixed conifer stand. Fires of this size and intensity can create their own wind, and develop into a fire storm. Courtesy of the Northern Rockies Incident Information Center. Cleared land geographic features, such as wide rivers, cultivated land, or clearings, can be natural fire breaks. They can be a barrier to fire spread because the fire cannot leap the fuel-deficient span. However, this effect is not absolute; wind can lift burning particles over these natural fire breaks onto a new fuel load. The topography of slope, both angle and orientation (to or away from the sun), can significantly affect fire spread. Slope increases flame contact with uphill fuels, thereby more rapidly heating them and increasing combustion potential. Therefore, the fire burns more intensely and quickly. Uphill winds accelerate this process, as do slopes that face the drying warmth of the sun. Fire lines, which are manmade barriers to fire spread, such as trenches and expanses of cleared vegetation (see Fig. 6). Air drops, which are the deployment of water or fire retardant from aircraft onto the fire and/or onto uninvolved areas to hinder fire development (see Fig. 7). Firing out or backfires, which is controlled burning of the fuel between the control line and the fire head to stop the advance of the fire by depriving it of combustible fuel (see Fig. 8). Class A Foam, which may be applied to slow burning fuels to extinguish them and/or applied to unburned fuels as a protective barrier against ignition. Limit the application of water to areas that have already burned. These areas may contain important clues to fire spread and cause and these indicators may be obliterated by copious amounts of water. Limit dragging hose through burned areas. Dragging can obliterate patterns and destroy fragile evidence. Park firefighting vehicles away from burned areas. Vehicles and the associated foot traffic may trample evidence and indicators. Be especially sensitive to this possibility at roadside fires, where, if an arsonist set the fire, there may be tire tracks, footprints, and trace evidence at the roadside. 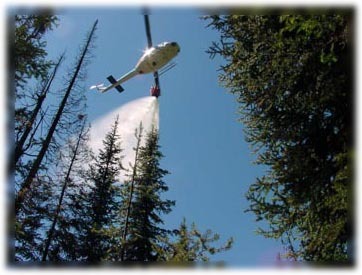 Pictured above: Aerial fire suppression during the Burgdorf Fire (Payette National Forest, Idaho). Photo courtesy of the National Interagency Fire Center. Pictured above: Firefighters dig a fire line during the Burgdorf Junction Fire (Burgdorf, ID). Photo credit: Karen Wattenmaker. Photo courtesy of the National Interagency Fire Center. Pictured above: Idaho Panhandle Hotshots starting the burn-out at Fish Creek Fire (8/26/03). Photo credit: Michael Rieger. Courtesy of the Northern Rockies Incident Information Center. Wildland fire causes are varied and the most common ones differ substantially from the most common structure fire causes. Major wildland fire causes (as ennumerated by NFPA 921) and potential indicators of that cause are as follows. Incendiary Fire. Wildland fires set intentionally often begin in accessible areas because they are easily reached, but often lightly traveled--and therefore the firesetter is less likely to be discovered. The method of ignition varies and may be immediate or an improvised delay device. Juveniles may intentionally or accidentally set a fire using matches, a lighter, or other device. Incendiary fires can be indicated by ignition source remnants, ignitable liquid residue, evidence of human presence (such as footprints or tireprints), multiple points of ignition, trailers, and remains of delay devices. The method of ignition is limited only by the imagination of the arsonist, but Kirk's Fire Investigation reports that the most common time-delay device is a bundle of matches or matchbook surrounding a burning cigarette. Pictured above: Lightning strikes a woodland ridge. Photo courtesy of the National Interagency Fire Center. Lightning. When lighting strikes, it can spark a fire. Lightning often strikes trees, power lines and transmission towers, and rocky peaks (see Fig. 9). Lightning can also strike open ground. Lightning can splinter or explode the item it strikes and can also leave a glassy residue, called fulgurites, as the heat melts sand on the ground or on vegetation. Lightning strikes must be confirmed by the weather service or a lightning detection service. Be aware that a fire might not start immediately after a lightning strike. The fire can smolder for some period of time before becoming a full wildfire. Electrical transformer malfunction or explosion, dropping flaming, sparking, or hot material onto fuels. Damage to the electrical equipment over the area of origin is often present. Overhead power lines coming in contact with trees. This ignition will often leave a brand where the power line and the tree made contact. Animals short-circuiting the power line, then falling to the ground and spreading flame to fuels. Fallen wires from wind or storm damage spark and ignite fuels. Damage to the electrical equipment over the area of origin is often present. Arcing between conductors brought into accidental contact, often by high winds and/or tree limbs. Trees falling on power lines and grounding them. Damage to the electrical equipment over the area of origin is often present. 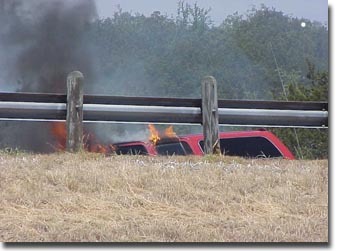 Pictured above: The Ranger Hills Fire (TX) was ignited on August 29, 2000 when this overheating Suburban leaked flammable fluids which flowed downhill, also igniting a semi-tractor trailer. The burning vehicles then ignited the adjacent vegetation. The long-term drought and dense vegetation led to extreme burning conditions within minutes. The Ranger Hills Fire produced a smoke column approximately 2000 feet tall in only 30 minutes. Photo courtesy of the National Interagency Fire Center. Equipment Failure. Machinery and vehicles in wildland areas are subject to electrical and mechanical failure that can spark a fire. Equipment also often requires ignitable liquids, such as gasoline, that can start a fire if ignited by a spark or other flame source (see Fig. 10). A suspected equipment failure cause should be examined by an expert and the cause of failure and chain of events, including first material ignited, must be established. Any appliance or equipment failure should be reported to the U.S. Consumer Product Safety Commission. Pictured above: An accretionary lava ball from Kilauea comes to rest and smolders on the grass after rolling off the top of an 'a'a flow in Royal Gardens subdivision (Hawai'i). 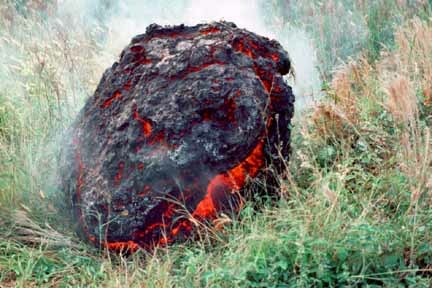 Accretionary lava balls form as viscous lava is molded around a core of already solidified lava. Photo credit: J.D. Griggs, 7/2/83. Photo courtesy of the U.S. Geological Survey Hawaiian Volcano Observatory. Natural Disaster. Lava and superheated ash from volcanic activity can spark fires (see Fig. 11). When volcanic material heated to thousands of degrees comes in contact with fuel, the fuel can combust. Volcanic activity in the United States is tracked and can be verified by the U.S. Geological Survey (volcanoes.usgs.gov). Volcanic events are usually well documented. NFPA 921 (2001 Edition), Chapter 23: Wildfire Investigations. DeHaan, John D. Kirk's Fire Investigation. Fourth Edition. Minnich, Tom. Handbook for Assisting in a Wildland Fire Investigation. National Wildland/Urban Interface Fire Protection Program. 1 Solar convection is the daily process of air heating and cooling, which produces diurnal winds. During the day, air heats up and rises, creating winds that blow upslope. At night, daytime heat dissipates, and the cooler air sinks, creating downslope winds.